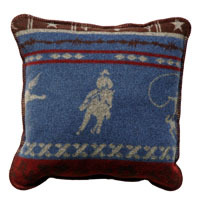 Giddy up and ride-em high, a really classy looking western themed pattern in cranberry and sky blue. 20" pillow with poly-fill pillow insert. Size: 20" x 20" x 6"
Item: GWR-P7 Price: $69 ea.